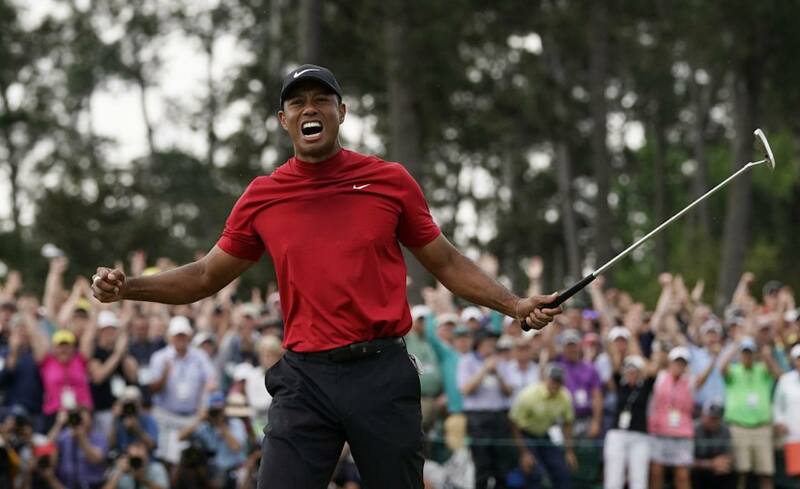 While Tiger Woods was winning the Masters at Augusta National, bettors were cleaning up at sportsbooks that reported losses as large as $1 million. It was one of the worst days for the betting facilities in recent memories. It was the fifth green jacket for Woods, who began the day two shots behind third-round leader Francesco Molinari. The Westgate Las Vegas SuperBook had the odds going into Sunday as 7/4 for Molinari and 3/1 for Woods. Molinari looked solid until the 12th hole when his tee shot went into Rae’s Creek and he walked away with a double bogey, giving Woods a share of the lead. At one point six different players grabbed the lead or a share of it, but they were just keeping it warm for Woods. At the par 5 15th, Woods got the outright lead with a birdie. On the 16th the 43-year-old hit his tee shot on the par 3 to three feet for a two shot margin he would never relinquish. “I had a pretty good feeling going into this week that I was going to be able to contend in this event,” Woods said. So did gamblers, who backed Woods as far back as August when his odds to win were at 12/1. They moved up and down during the months preceding the tournament, but settled at either 12/1 or 14/1 depending on the sportsbook. One savvy gambler made an $85,000 bet on Woods with a William Hill facility in Nevada at 13/1 two days before the event. The anonymous gambler collected $1.19 million. US trading director Nick Bogdanovich congratulated the out of state gambler in a statement. “It’s great to see Tiger back. It’s a painful day for William Hill – our biggest golf loss ever – but a great day for golf,” Bogdanovich said. Two mobile sportsbooks in New Jersey, Fan Duel and Draft Kings also reported more than $1 million in losses. Jay Kornegay, the Westgate’s VP of race and sports operations, said his place lost close to six figures on Woods. The odds steadily went down with each round Woods played. After the first round the adjusted odds went to 10/1. It was 6/1 before the third round, and finally 3/1. It wasn’t just straight bets that were cashed. Woods also brought joy to prop bettors as well. Winning margin of one stroke (+250), under 11.5 bogies +100, finishing top 10 (+160, and finishing top 5 (+350) all paid off. Even Woods’ bogey on the final hole was profitable. “What will the winner’s score on the 72nd hole be?” was +150 for his bogey. Not everyone is happy with Woods, however. In one of the most puzzling bets in the history of sportsbetting, one gambler at Caesars bet $20,000 at -100,000 odds that Woods would not win all four majors. He hasn’t lost yet, but even if he wins, he collects a whopping $20. Lines were quickly established for May’s PGA Championship and next year’s Masters. Not surprisingly Woods is the favorite to win both. He is at 8/1 to win the PGA Championship with Dustin Johnson next at 10/1. At the 2020 Masters he is 8/1 to win with Johnson and Rory McIlroy at 12/1. After his triumph at Augusta on Sunday, bettors might take his comments as a potential prophecy. Gone was the hesitation in how he would do at a major. The confidence in his game is back, and that should be a warning to those competing against him, or those thinking of not betting on him.